A few months ago, I decided to embark on a new journey to speak regularly about truths I found important to me. I did not have a clear vision of where this journey would take me, but I knew it was important. So I blazed forward with a thundering heart of excitement and a thrill of the unknown. What exactly would I talk about each month? And could I eventually do two posts a month like I original thought about doing? Well, the topics each month so far have found me. I write when a great truth inspires me to do so, and it’s usually something I am currently working through on my own personal journey. But I think that’s where the true gold can be found. If it’s not from the heart and felt deeply, then the truth rings hollow. As for two posts a month, I have decided one is what I can do comfortably, especially now that I am starting up a brand new plan of (though it’s mostly just a revamp and extension of my old plan) to continue writing posts here, write on my current fiction and start some new fiction, and begin my own publishing company (that will for a time only be publishing my own works, but may extend to others down the road). I, however, would love to still do two post some or most months–on this series specifically–and this is where perhaps you, and others, come in. My truth isn’t the only truth out there. This world is full of truths. The kind of truths that are spoken from the heart. The kind that ring so true it makes us want to stand up and shout. Those are the kind of truths this blog series is meant for, whether they are mine or someone elses. So I extend an open invitation to all who read this blog (and I have even sent a few personal invitations to those I know) to post on this series. What is your truth? What would you like to tell the world? What do you need to speak about just to speak it out loud to get it off your chest? Your truth matters. If your truth is to support awareness about something near and dear to your heart (whatever that might be), please consider writing about it here. If your truth is something you have discovered that changed your life for the better, let’s hear about it. If there’s a book or person you’d like to talk about that changed your life for the better, let’s hear about that too. This series is about promoting better connections, better life choices, and just better all around. It’s about helping people speak up about the things that are important to them, and maybe for others to be inspired or touched by those truths. We are a community of people that span this beautiful globe, and we are very fortunate to have the wonderful technology that helps makes those connections and keep them strong. There are a great many, however, who use the Internet to spread negativity and discontent. But I believe that we can move past (and possibly overcome) all of that by using the amazing tool of the Internet to spread light, love, and a better life for all. I personally have decided to rise up above the trap of negativity to adopt an attitude of positivity and grace. One of the things that has helped me do that has been speaking up about my truths and promoting positivity instead of negativity here and in all areas of my life. This sort of change in focus is a life changer. I have experienced it first hand, so can attest to that. I now offer a hand to you to speak your truth here, and this be at least one outlet that helps you speak up and allows others to hear about positive solutions, special insights you might have, and/or to become more aware of others’ perspectives. That change starts within. That change starts with your truth. That change can start here, or continue, or grow. I offer this series as a tool to help you, to help others, to help the world, in my own small way. 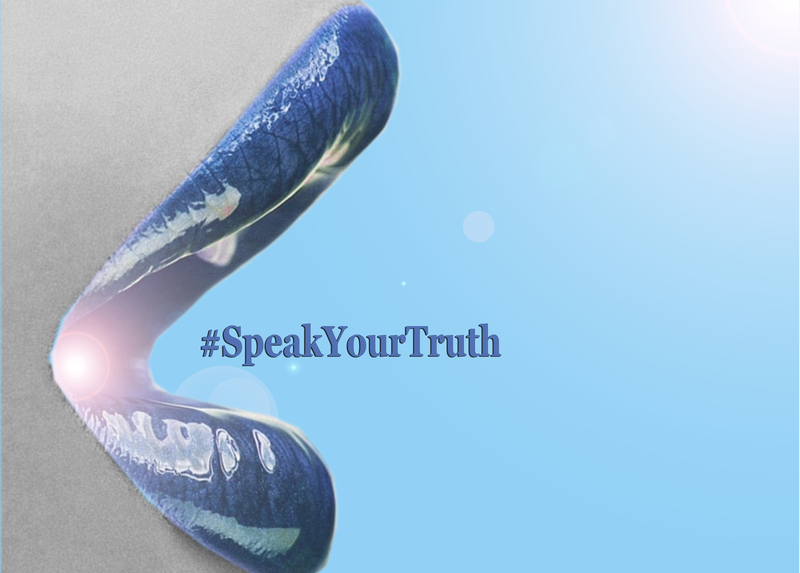 I have no problem posting here every single month and speaking my truth all by my lonesome, but when I conceived of this blog series I decided to name it Speak Your Truth, because I wanted this to be a collective effort for many, not just me. I hope this dream can be realized with the help, support, and efforts of people like you. At any time (now, or in the future), you feel compelled to speak up, and choose to do so here, please contact me with what you would like to talk about. Also be prepared to provide a short bio and picture, as I insist you get all the credit for your incredible work. I am simply a platform for you to stand upon. I encourage you. I support you. And don’t shirk away from this opportunity if you don’t consider yourself a writer. I have no problem helping to make your truth the best it can be. What’s important is your words, your truth, and your effort. Let us all speak up and out, and listen to others as they do the same. In this way, perhaps we can all come to better understandings and connections that will enhance our lives and the lives of those around us. We all want to hear what you have to say, so come Speak Your Truth.